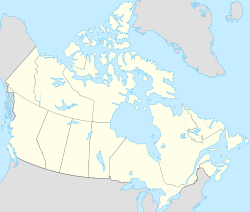 Canadian Forces Station Churchill was located at Churchill, Manitoba. The ionospheric study station started in 1950 as HMC NRS Churchill, was renamed to HMCS CHURCHILL in 1956 and finally was renamed to CFS Churchill in 1966 as part of the Canadian Forces Supplementary Radio System. ^ Proc, Jerry. "hmcs Churchill". jproc.ca. This page was last edited on 1 October 2018, at 21:08 (UTC).